My preyers have been answered! Well obviously we should be taking our lead from the more oppressive regimes in the world. Doing pretty well, John. Record amounts of precipitation – as one should expect from increased ocean temperatures. Brilliant – I love how you reduce the issue to it’s most painful essence that beleivers still somehow manage to resist. I guess the delusion that there’s an absolute truth is one of those weird false comfort things – I expect that people who cling to religion are those that cannot deal with change and cultural adaption – and that if they had been born in another country, would be just as strong a beleiver in the dominant faith of that other country. Religion is more a symptom of the personalty or need to be an insider to “truth” and the torch bearer for “tradition”, with the specific religion being neither here nor there. I have no problem with the notion that an absolute truth about religion exists. I just don’t believe that I or any other human knows what it is. It’s like the question of whether there is life on Jupiter. I believe that either there is or there isn’t (so an absolute truth of the matter exists), but I do not believe that there is, and I do not believe that there isn’t. Like alot of people, they mistake their own definition of religion, their own personnal view of it, as the one “True” definition of it. And then procede to label anyone not agreeing as being not “true belivers”. A classic age-old technique traceable at very least back to Ancient Greece. Just in case you didn’t see this from the last strip. Author here is good lead for another J&M cartoonâ€¦..
1. Post link to darts association in a comic’s comments section repeatedly. 2. Rant about global warming every time to draw attention. You go, Sili and Urmensch! John needs a bit of OBJECTIVE education. Sorry John, but I’m just surprised to read the corporate/right-wing line on this blog. You could get some objective information if you stop watching/listening to Fox (False) News. Corporate main-stream media isn’t a lot better. Check out reliable science sites on the web and get the real information. Excuse me I thought the global warming thing was just another religious cult. Which is why I bring it up here, thought this was a haven for multiple points of view and sorry about the darts link just something I believe in….Still manage to enjoy the humor of the site regardless of political affiliation. Happy New year to everyone…. No, the fact that the earth’s average global temperature is rising is pretty much universally accepted now. There is, however, still some debate over whether the trigger for that warming is anthropogenic. Most climate scientists believe that the current human-caused increase in atmospheric CO2 levels is the cause, but there is interesting dissenting research. This is a haven for multiple points of view. Points of view that have been investigated and presented with consideration to relevant research and evidence. If you bring that speculative, emotionally driven subjectivity in here, expect to get taken to task on it. Don’t try to confuse me with the facts, I’ve got my mind made up! Oh so let me get this right the climate is actaully changing? As it has been since the fireball started to coalesce some 4.7 billion years ago? Ice ages, much warmer periods than now, etc. Well of course I believe that geez I took geology in college too. I don’t think there’s a question that the pollution we generate has an impact – the real question is what portion of all that drives climate change is down to us? Given that humanity puts more pollutants into the atmosphere annually than nature does (and we have for many, many years now), it seems almost certain that humans are the primary cause of global warming. Just believe the truth, like Mo… tho’ it would appear that ‘the truth’ is a moveable feast. Secular fundamentalist is an interesting concept, I wonder what Author will make of that as he works it through with our two boys. BTW, I just noticed John Moore’s question about the European weather. I read in yesterday’s Times (UK) that the northern hemisphere’s unusual coldness is due to a lot of very cold surface water in the North Atlantic, now where would that have come from? Anyone thinking of ice cap melt water? That’s how global warming cools us down! You might like to do some more research on that, depending on how you define pollutants. The vast majority of CO2 that is released into the atmosphere is from natural processes. Other greenhouse gases like methane, I’m not so sure about. (i.e., I’m not just going to regurgitate Wikipedia and pretend I know for sure). I’d like to hear more about what you mean and sources of info, though. 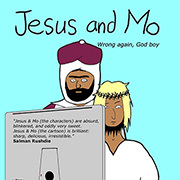 is Mo for Mohammad or Moses? oh waitâ€¦ first one obviously, the later is exempted by default â€™cause we dont want to be labeled as anti-semites, right? These days it is politically correct to acknowledge that your truth and my truth might be different. 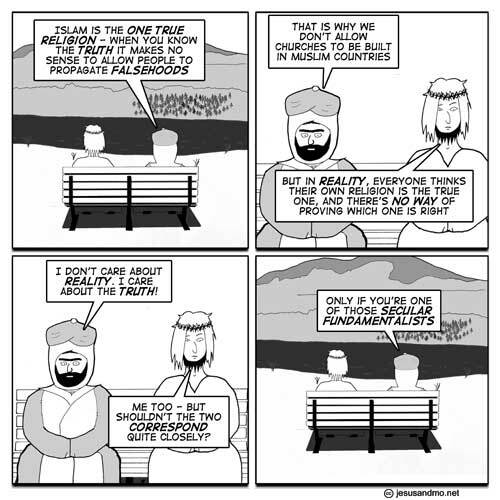 The reality therefore is that, for the relativist, each of us can uniquely say what is true for them and no one can gainsay that, as Jesus indicates in the cartoon. I think Jesus wins this round. For the absolutist, however – and science is absolutist – there can only be one correct explanation for any phenomenon; any explanation is either right because it is supported by observation or experiment, or wrong because it isn’t. For the absolutist, there is only one truth, even if no one’s quite certain what it is. Have faith in absolutism, folks. I really think you should be taking that discussion someplace else. It has nothing to do with the strip in question and this is so not the place to have such a discussion. Err, we’ll discuss what we want to thanks! All the smug little jokes have come out on the BBC’s Have your Say on adverse weather: ‘I now have 1ft of “Global Warming” in my garden’ *snigger snigger*. Grrrr. 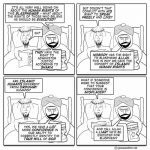 Why is Moses the crazy philosophical guy? I mean, it doesn’t fit with the trend, really. And this comic really needs more Ganesh. if there was Absolute Truth, then it would be objective and no one could claim an inside track on it or ownership of it. I tend more to there’s reality, there’s how we perceive and interact with it, and we act according to circumstances subjectively. There is a link to a NASA picture with Great Britian covered in snow. Probably will not see this to many times……. Next you can give a picture of a dry lake in Africa to prove that the oceans are not rising! Actually you’ll probably see it alot more offen due to the global warming effect. Gulf Stream Shutdown will give europe more or less the same climate as Canada. @Ayashi: When the Tin Islands again become ‘Ultima Thule’ and we will see the return of smoke in English chimneys. this climate change thing is getting on my nerves because it stopped being science and is now more about politics! Delusional bastards! Corporatist pigs! Political whores!